Happy Birthday 4n1 Combo with DRY Slide Bounce House. 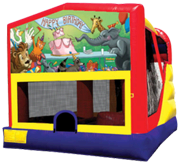 This is a 4-feature challenge bounce house with fun, offering a generous area of jumping area, basketball hoop, climb and slide. Take a look at the video to see a real life video of the inside. Big bouncing area with the slide built inside the bounce house. This bounce house is great for keeping the kids all in one spot. No worries of them sliding out and not going back in. The adults can also take a few trips down the slide and the kids get a great laugh. Remember this is a 15×15 Bounce House , not one of those smaller units that others try to pass on as a big sized Bounce House. We also have the Happy Birthday theme in a 7n1 Combo.